In the never ending saga of my affectionately named Bastardcaster, I made some more changes to my beloved frankenstein tele. Added a GFS Retrotron Liverpool mini-humbucker to the neck position, changed the bridge out for a Bigsby rocking bridge with the bowtie base, and cut a new pick guard for it. Spent the last hour playing it through my little 5E3, and I'm digging it. Incredibly raw tones coming out of this thing, and can get a fairly convincing Ry Cooder tone out of the middle position. That truly is a Barstardcaster, but it looks great! I really do need a guitar with a P90. 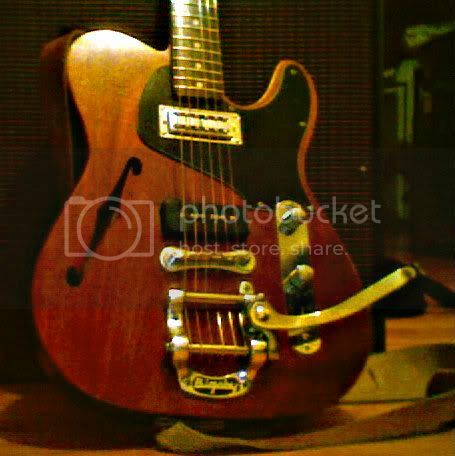 P90s are wonderful pickups, especially in mahogany guitars. And for $30, the GFS P90 I have in this guitar is awesome. I originally bought it as a place-holder until I could afford a Fralin, but I don't see much reason to upgrade it. I may experiment with different magnets, though. It's very easy to swap them out on P90s. Been a while since I've been posting, how've you been, Lefty? I've sort of been considering a GFS single coil sized bucker for my Strat lately, but I really don't want to give any money to GFS, as they've screwed me hard, twice. Everyone seems to like them, but I wasn't too impressed and they sent me damaged goods and refused to replace them, unless I paid. I've been good. I moved back to Washington a couple months ago from Arizona. It's good to be back in the cold haha. How've you been? Yeah, I've heard a lot of mixed things about Guitar Fetish's customer service, but I've been pretty lucky when I've ordered from them. I did get a buggered set of Kluson style tuners from them, though. One of them had a stripped gear, which they blamed on me and wouldn't replace it. Other than that, I've been happy with their stuff. I finally got settled in my new apartment and, after a long and unpleasant process, got my internet service hooked up. I'm living right above the music store I work at, which is great. Haven't been playing as much as I'd like to, but I have a project in the works with a drummer I used to play with, so hopefully we'll be able to make something happen. I've also been assembling a reasonable set of solo tunes, so I'll be searching for some gigs for myself soon. The town I live in has about 6 different places with live music within two blocks of my apartment, so I should be able to find something. They love blues here, too. Impressive for an uppity town in Minnesota. Cool! Glad things are working out!